« How do you assess LV diastolic function in the presence of Atrial fibrillation ? A team of white coated humans in various gender and ages swarmed the patient . ECGs and text where shared among the STEMI alert group through I pad 3 which transmitted HD quality ST elevation with a retinal precision . A senior consultant insisted to shift the patient to cath lab direct . Since he had signs of cardiac failure , one of the wise Junior fellow wanted to correct the failure with Nitroglycerine and Dobutamine before rushing him to cath lab . Hence he was put on hold in the side room of ICU . Echo examination showed LVH and wall motion defect could not either confirmed or ruled out . Initial Troponin was negative . In the mean time the bio chemistry results came. He had a creatinine of 5.2 and Potassium of 6 meq . Hence the patient was diverted to Nephrology unit and dialysis was done. The next day morning his ECG looked like this . It may sound a pessimistic , but still I would consider the above episode is a rare example of appropriate care happening ! This patient was diverted in a timely fashion from cardiology care to the Nephrology . Please note , it is not the the clinical acumen that helped here. If he had not presented with LVF he would have been a victim of inappropriate care and landed on the cath-lab table directly ! Every moment in clinical medicine is important , especially during the genesis of diagnosis. Where the patient lands . . . in a frighteningly large hospital is as important as the disease process itself. In this scientifically arrogant medial atmosphere most of us, are tuned to view every problem as their own ! This is the default mode of modern medical thinking process . How faulty we are ? 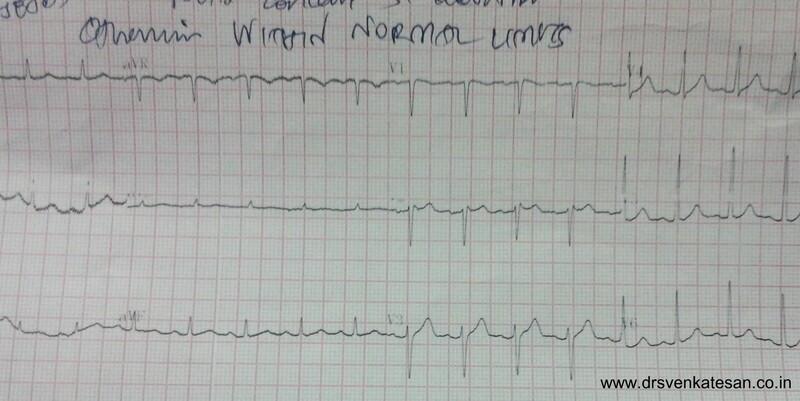 By the way what is the mechanism of ST elevation and Tall T waves in hyper-kalemia ? Is it a true ST elevation ? There is reason to believe the tall T waves drag the fag end of ST segment along with it . Next is related to QT interval . Hypo-kalemia widens while hypo-kalemia does the opposite . ( though not classically) . Whatever be the mechanism it is something to do with potassium ion flux .Transient intra-cellualr hyper-kalemia.